The first time I encountered working terriers in East Anglia was, some years ago, during a few days spent, east of Lakenheath and Mildenhall, in the Thetford Forest area and at a nearby feature called Frog Hill, where rabbits abounded. A small group of dedicated 'squirrellers and rabbiteers' (as they termed themselves) were using small, mainly rich tan, rough-coated terriers in each location for a day's sport. The leading terrier-man working at Frog Hill described his dogs as 'Norfies' but made no claim for breed-status for them. His terriers were very determined but quite calm and composed, none of the usual terrier voice - the loud squealing of earth-dog expectation - just a steadfast focus on the job in hand. 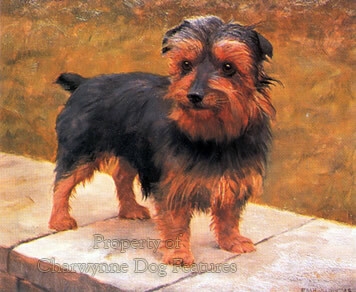 One of the dogs was black and tan and reminded me of a rougher-coated, small Lakeland or Welsh Terrier. I was impressed both by these terriers' soundness of structure and their almost silent dedication to the job in hand, working closely but safely with ferrets and not confusing relentless zeal with frenetic, noisy boisterousness. This was a scene straight from one of veteran sportsman James Wentworth Day's fascinating books on the sporting world in East Anglia, written between the wars. Terrier breeds from East Anglia went largely unrecognised before the advent of showing and the need to establish distinct breed identity was created. Sportsmen there seemed uninterested in claiming local names for sporting dogs bred and developed in those rural areas. Small red-tan terriers were once favoured in East Anglia, a Master of the Norwich Staghounds called Cooke establishing a strain of his own. 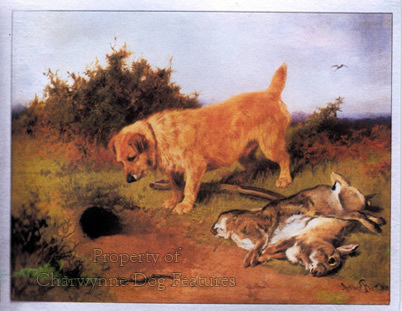 A character called ‘Rough-rider’ Jones who had been in Cooke’s employ, took another hunt position in Leicestershire and took some what were termed Red Norfolk Terriers with him. Frank Jones had arrived from Ireland with a brace of Glen of Imaal Terriers and quickly acquired what was known locally as a Trumpington Terrier, an ancestor of the Norfolk, sometimes called the Cantab Terrier, because the undergraduates of Cambridge prized them so much. 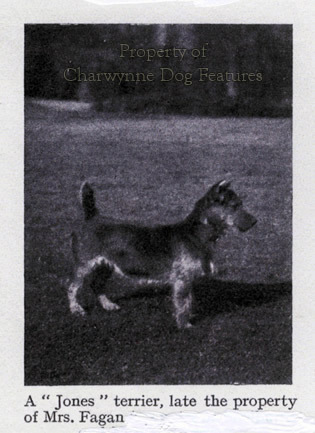 Jones purchased every red-coated whelp he could, from a mating between a Dandie Dinmont crossed with a Smooth Fox Terrier and what was described as a cross between an Aberdeen Terrier and a Cantab Terrier. 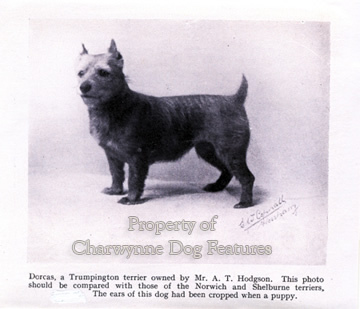 He had a head for business and eventually exported a number of his terriers to America, where they became known as the Jones Terrier. Various American hunts used them, finding them excellent stable dogs as well as fearless earth-dogs. Jones got his foundation stock from a terrier breeder called Hopkins, who actually called his dogs Trumpingtons; he favoured a 14lb dog, red or yellow tan and not ‘too strong-headed’. Like ace terrier-man Jocelyn Lucas, who was a great fan of Norfolk Terriers, he linked the big head with heavy bone, undesired in a working terrier. Many of these dogs had their ears cropped before the practice was made illegal. 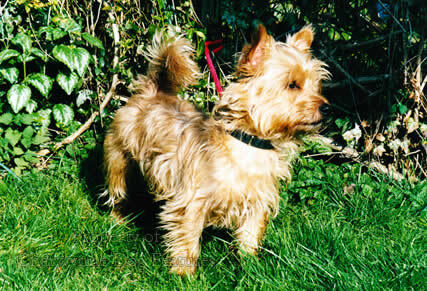 Despite their long local history, the Norwich Terrier, then both prick and drop-eared, was not admitted to the Kennel Club’s register until 1932, with the drop-eared Norfolk variety following suit in 1965; some still insisting that this is one breed, embracing both ear-styles, as in the Skye Terrier, rather than two, as the KC was persuaded. There should be more to a breed than the set of their ears. Both breeds are favoured at a height of 10 inches at the withers, with a hard, wiry, straight coat lying close to the body, in all shades of red, wheaten, black and tan or grizzle, with small white marks or patches tolerated but undesired. 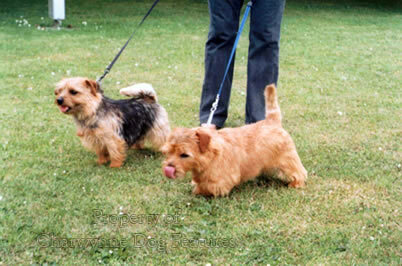 In the 1950s, before the separate recognition of the drop-eared dogs as Norfolks, there was much discussion in the dog press about the merits of both styles of ear-set, Mrs EH Hardy writing: “…it is a pity that any comparison should be drawn between the prick and our drop-eared Norwich Terriers, as apart from the set of ears (surely a matter to be left to individual preference) the little dogs have the same characteristics and are equally good at work…There is a pack of tiny working terriers in Eire, (top weight 6lbs), used entirely for work and all have prick ears. They were bred from a Norwich and crossed with hunt terriers…” Many claim that the prick ear gives better hearing. The Crufts judge of Norfolks at the 2010 show reported concern over the number of poor heads and weak muzzles found in the entry, not a good sign in a sporting terrier breed. A championship show judge in 2011 reported ‘plenty of steep shoulders and short necks’, serious faults in an earth-dog. There have also been unwanted occurrences of ‘fluffs’ in the breed, that is, a soft silky rather luxurious coat, comparable to that of the Soft-coated Wheaten Terrier of Ireland. Fluffs can turn up in the Norwich too. Coat texture matters a great deal in a working dog. 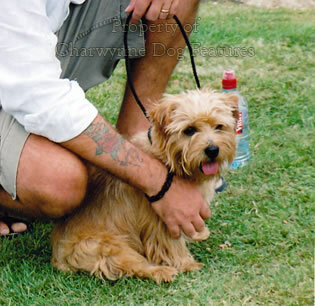 In 2015, well over 550 Norfolk Terriers and nearly 150 Norwich Terriers were newly registered with the KC; as breeds, both are well-supported. But I wonder how the 'Norfies', the working strain is getting on; their future is even more important.